Summer is already here and with it the heats and also the days and nights outdoors eating or having dinner. And for those evenings we propose you a lot of fruits decoration.Cool, fun and very simple ideas that will help you to create an original and different table or to incite your guests to eat fruit because you will present it so beautiful that it will be impossible to resist. And is that the fruit is perfect in this time but also can give you a lot of play when decorating a table, do we discover? Nothing simpler! 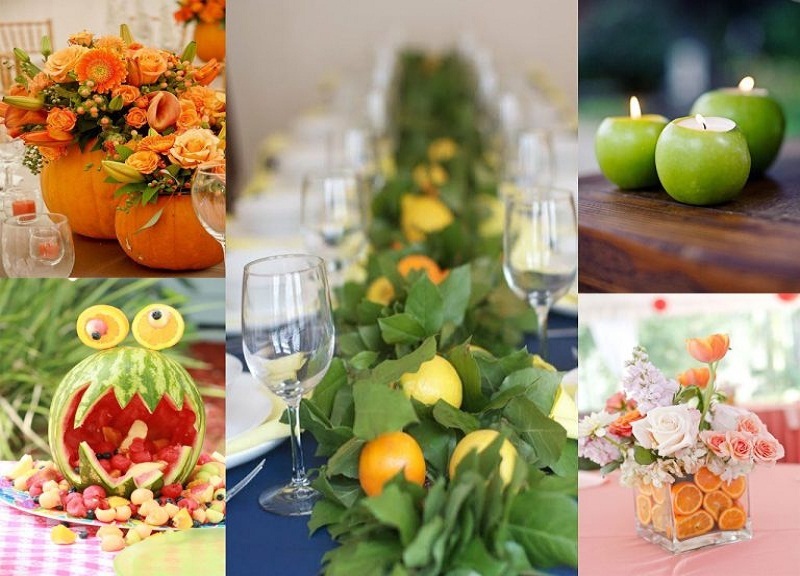 Combine fruits and leaves in different shades and get an original and ideal centerpiece. You can choose a decoration in red and orange or decant for yellow and green … In this season there is so much fruit that you just have to decide what color you want to set your center and choose fruits more suitable than later you can refuse to prepare juices or smoothies with which you will be happy at home. Tables in full color so simple and practical! Citrus fruits are another fruit that we can use in many ways. 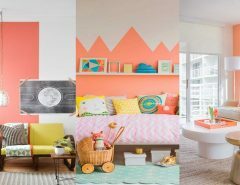 Oranges, lemons or limes in addition to its precious colors has an odor that will help us create a refreshing environment to mitigate the heat of these days. One of the best ideas for fruits decoration is to cut them into slices and use them to decorate pots and glass vases and thus give a different point to our table arrangements. Fill it with flowers or with floating candles and you will have a table like that. Do not you love them? You can also take advantage to reuse glass jars and fill them with slices of lemon and orange plus some herbs and a candle. Another fantastic option is to present the fruit in an original way. This way we can use it to decorate the table and at the same time it will also be the perfect dessert for the evening. There are many fun and original ideas we can make in fruits decoration. Like this fruit tree or use the ice cream cones to present it already prepared and cut to make it irresistible to our guests. Another that I have loved is to create names with fruits for each guest as a decoration of your glass, for example. This type of ideas are great for children’s parties and is a good way to encourage the little ones to eat fruit. Try it and sure you repeat because you will be very successful! also very beautiful is turning the roses into strawberries and using them to decorate the table. Here you can see how it is done, it seems simple but I do not know if it will be so much. Although if you have a little patience and a good pulse, you will surely get a nice result that will also become the center of attention. And then you can serve them with cream as a delicious dessert. Apples can also give us a lot of play in fruits decoration, in addition to their variety of colors have a shape that can be very useful. For example as candle holder. Here you can see step by step how to turn an apple into a candle holder as refreshing and colorful. Or you can also decorate it and put a small note to mark the seat of each person, super original! The pumpkin is a vegetable but I could not stop including it because it can give a lot of play as a vase when it comes to creating centerpieces. We talked about it some time ago and today we remember its versatility. They can be painted and used as such or emptied and used as a vase for your flower arrangement. The result is always great and also lasting. Because pumpkins are not just for Halloween. Another fruit with similar use and that is fashionable in the fruits decoration is the pineapple. That’s what I’ve thought about seeing the incredible ideas that people make with watermelons. I do not get over my amazement! But I love the idea and I think it’s a genius for a children’s party or for the older ones who will surely enjoy seeing some of these works of art in fruit. Do you dare to try? Why would you decide? I really do not know what to choose but the shark has made me special grace although the baby cart also has its point, do not you think? This summer nothing boring fruit, bet to use it to decorate and convert it into what your imagination tells you and you will surely surprise your family and all the guests. And you will have the most original and refreshing decoration for your summer meals or dinners. And do you join the fruits decoration on your table?